This tam was conceived during a blisteringly cold week in Boston, one when I could not bear to be outside without many added layers. I quickly noticed how much bag space a typical hat and pair of mittens required, and tucking those things under my arm quickly became a bore. 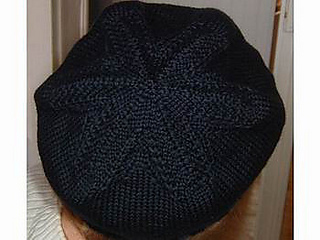 The great thing about a tam is that it folds flat, but expands to provide sufficient ear coverage and wind protection. The snowflake motif adds a bit of texture to what otherwise is a very simple knitted item. The snowflake results from working the chart between each column of decreases. Alternating the charted design with a panel of straight stockinette stitch would yield a more abstract design.